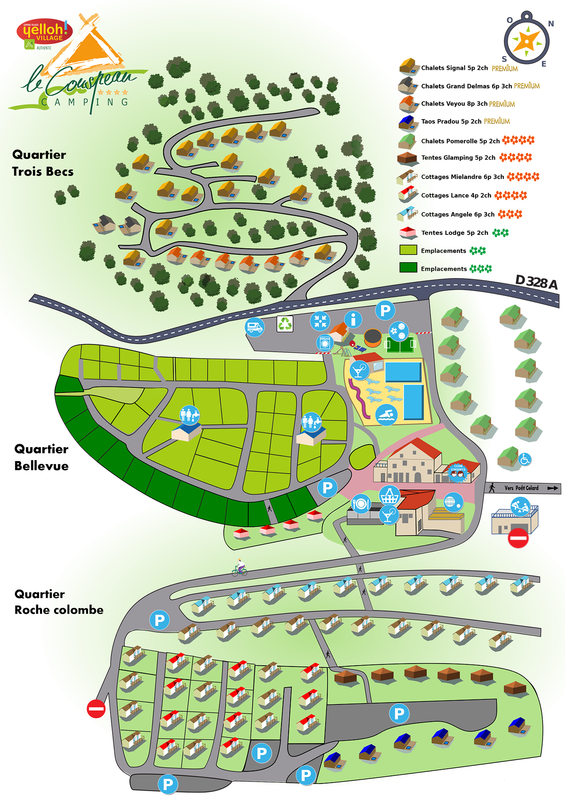 The camping Le Couspeau welcomes you to the authenticity of the Drôme! Cirques, gorges, waterfalls, forests and other natural landscapes make it a thoroughly remarkable place. In this department in south-east France, come and find out about all that awaits you here on holiday. Do you enjoy a hike? A spot of climbing? Walks in the heart of nature? Then head for the Saoû Forest! Mid-way between the Vercors and Mont Ventoux, one of the loveliest and largest forests in the Drôme awaits you for some truly unforgettable times. Fancy some bathing in a gorgeous setting? The whole family will just love the magnificent Pas des Ondes artificial lake. Or perhaps you're keen on birds? You really won't find Upie zoo disappointing either! Take in an amazing show featuring its 200 different species from all over the world. Or maybe crocodiles are more your thing! Then come and see them at the famous crocodile farm in Pierrelatte! This region is overflowing with little villages, all of which are thoroughly charming! You can use the markets as a means of discovering the most attractive villages! One day, one market, one village! Here is my list of the villages of most interest around the campsite, and I invite you to enjoy a tour of these villages at the same time so as to find out about their appeal! Monday - stay in bed! On Mondays, there are no markets of interest nearby! But you can still make the most of it by having a look around the region and popping in to see some of the loveliest villages in Drôme! The hilltop village of Poët-Laval is listed as one of the most beautiful villages of France (Les Plus Beaux Villages de France). Must sees: The museum of Dauphinois Protestantism (16th century), the 12th century castle, the chapel of St Jean des Commandeurs, the Commanderie and the Raymond du Puy international arts and entertainment centre. Tip: Tours with commentary of the old village every Wednesday morning during July and August. Meet at 9.30am outside castle. Famous for its tower, and well-known for having the tallest keep in France at 52 metres, this town also draws people due to its lovely mediaeval district at the foot of the tower, as well as to its Provençal setting made even more attractive by its variety of craftsmen. This is one of Drôme's really lovely hilltop villages, and the pride and joy of the Bourdeaux region and the people who live here. The castle was built on top of the ruins of an old fortress that belonged to the counts of Valentinois. You can reach it via a delightful little cobbled alleyway. The village of Poët-Célard is a must-see during your exploration of the Bourdeaux region. During summer, all sorts of activities take place in this mediaeval location which is becoming increasingly popular. On Tuesdays, it's all happening in the centre of the town of Grignan from 8am to 1pm! On the Place du Mail you'll find lots of people selling goods in a market which is mainly food-based. Perfect for some healthy shopping options for the whole week at Le Couspeau! Grignan is located in Drôme Provençale, in the south of the Drôme department. The village is mainly famous for the countess of Grignan's splendid castle, she having been the daughter of the Marquess of Sévigné. The Renaissance collegiate church, near the castle, is a popular place to visit, as it is home to the tomb of Madame de Sévigné. But Grignan is above all a delightful Drôme village with a real Provençal flavour, featuring sunshine, lavender, truffle patches and vines. On Wednesdays, this hosts a little market selling regional produce from 8am to 1pm. It is a wonderful little village at the foot of the Vercors mountains, and the perfect spot from which to set off to see the high plateaux. Don't miss the forest of Lente, the Ambel Plateau, the resistance museum and the winding roads! On Thursdays you should head for Nyons between 8am and 1pm, where you'll find a very well-regarded traditional market selling local and organic produce, as well as fish and clothing etc.. In the afternoon from 3 pm, there's a little market outside the Château de Bourdeaux, just a few minutes from the campsite. You will just love the pretty village of Bourdeaux, with its heritage stemming from the 12th century. Here, you'll find all sorts of local farm produce. Bourdeaux is a popular place to visit due to its climate, its sense of welcome, its lovely scenery and the legend of Alberte de Poitiers! On Fridays you should head for Dieulefit! There's something for everyone at this big market with more than 50 stallholders! Shopkeepers, market gardeners and local producers come together form 8am to 1pm to sell traditional and local produce, olives, garlic, herbs and spices, fresh and cold meats, fresh fruit and vegetables, fish, flowers, organic produce and, of course, the famous Picodon cheese! In summer, you'll find all sorts of things for sale, including scented soap, clothing, jewellery, wooden toys, craft-made hats, decorative items and books. This Provençal market is also very lively! Various pottery and ceramics craftsmen demonstrate their skills here too, and the whole thing enjoys a musical accompaniment! As Dieulefit is listed as a tourist destination, its heritage and environment enjoy protected status. But what this place is really famous for of course is its pottery, and Dieulefit is recognised by various artists as the town of ceramics. Don't forget to come and have a look around the Maison de la Céramique and see the pottery exhibitions hosted here. On Saturdays, there is a lovely little market on the little square of Saou. From 8am to 1pm, a few local producers get together to show off the local specialities. Saou is a little village nestled at the foot of le Roc and Europe's highest hilltop syncline, and is famous for its forest, where you will come across flora and fauna found only in the Alps and Provence, rubbing shoulders with one another. The forest of Saou is a semi-enclosed area in the shape of a ship, and is 12km long and 2km wide. Les Trois Becs, in the east, form its summit (Roche Courbe, le Signal and le Veyou). The perfect spot for walks with the family and other pedestrian outings! On Sundays, the splendid little Provençal market in Nyons is held. This is a really pleasant and colourful market, selling mainly Provençal goods. Sundays, 8am to 1pm from June to September. Nyons is a lovely Provençal town that's famous for its olives! Its sunshine, balminess and wonderful scenery make it a must-see during your stays in Drôme provençale. As well as the quality of the town's local produce, it also has a rich history, and you should have a look around and take in the Tour Randonne, the Place des Arcades and its famous Roman bridge.